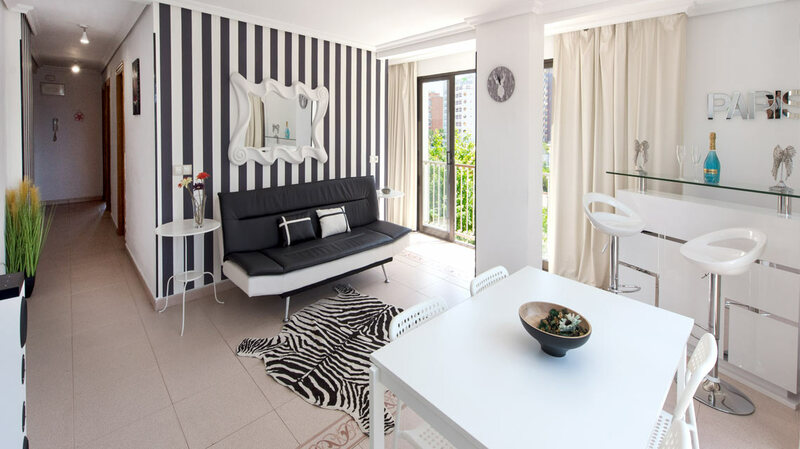 A sophisticated, two-bedroom holiday apartment for rent, with glamorous pop art features throughout. If you’re bored of the status quo and want to let your hair down in Benidorm, this is the place! A fabulous living room, perfect for a Spanish Fiesta! The stylish corner bar is made for serving an early-evening spritz; or why not serve up some nibbles on the dining table overlooking that stunning Benidorm coastline? There is a relaxing sofa in a bold red and the whole room is accentuated by stylish pop art. Of course, as with all our unique apartments, you’re covered in terms of the mod-cons too: check out that flat-screen TV and those speakers! But what really sets this room apart is the dual-aspect French windows, which create a brilliant ambiance and holiday vibes all day long! This is such a versatile room, with a wonderful sense of space and a light and airy feel. 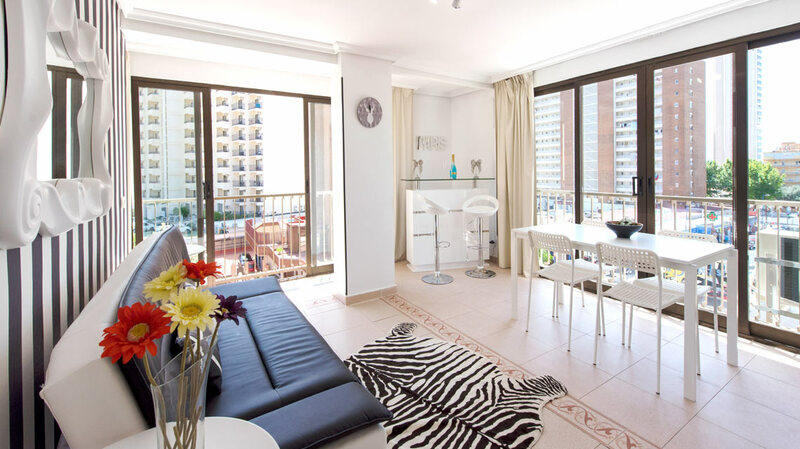 From putting on your glad rags to having a cheeky siesta, this room will fit your every need. You’ll notice the room has a wonderfully chilled-out nature, thanks to all the verdant plants and beautifully tiled floors. The clean, white walls continue the feelings of calm, which are delicately accentuated by modern pop art prints which frame the three beds. The alcove area, complete with French windows, lets in plenty of light – is there any better way to wake up in the morning? 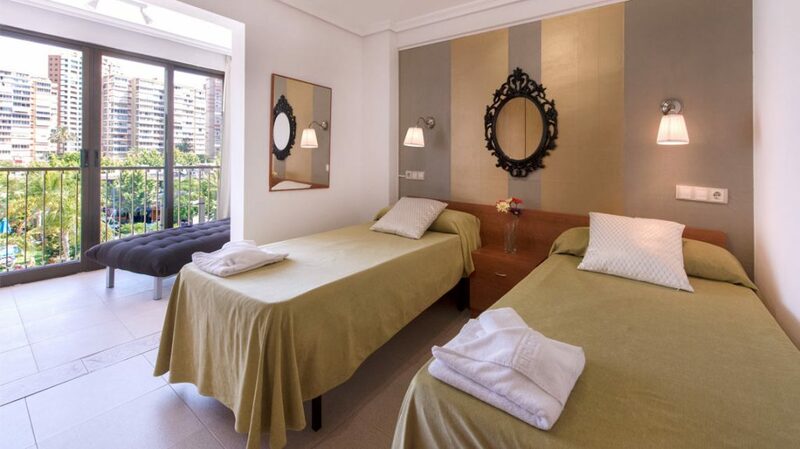 After dancing the night away in the heart of Benidorm, you need a cozy and comfortable place to rest. The calming décor in this twin bedroom is perfect for unwinding, while the headrests and print above the two beds give this space that little ‘je ne sais quoi’. The blue bed linen is eye-catching, and yet another wonderful contrast to the beautiful, white walls. The contemporary bathroom, with its modern lighting and glistening tiles, provides you with a quiet oasis in which to luxuriate. The extra touches, from the purple orchid to the towels and mats, make this space feel like home. 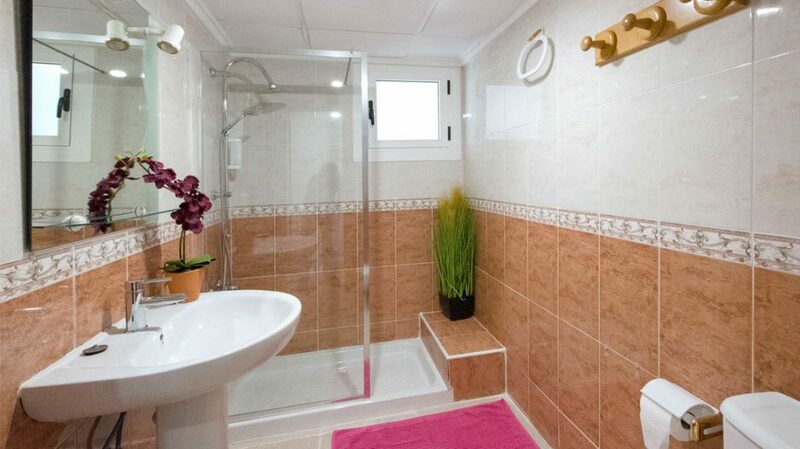 Indulge after a day at Levante beach in the brand new walk-in shower – because you deserve to feel pampered. You can really see why they say that the kitchen is the heart of the home in this sleek and high-quality room, complete with granite tops and tiled floors. 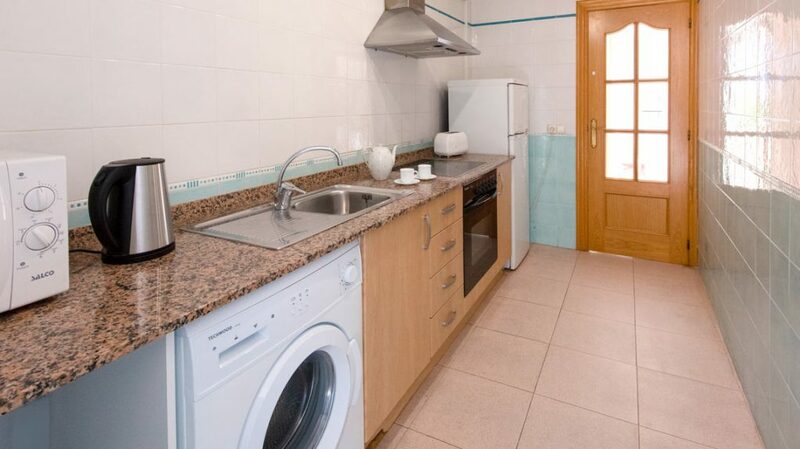 It is important to us that you have everything you need during your holiday in Spain, so all our My Pretty Payma holiday apartments include: fridge/freezer, oven/hob, kettle and washing machine, as well as crockery.